The Ajanta Caves, a UNESCO World Heritage Site, are located about 100 kilometers outside of Aurrangabad, India (it takes about 7 hours on a train to get to Aurrangabad from Mumbai) and while the oldest of the caves date back to the 2nd century BCE, they weren’t widely known until 1819 when a British tiger hunting party stumbled across them. 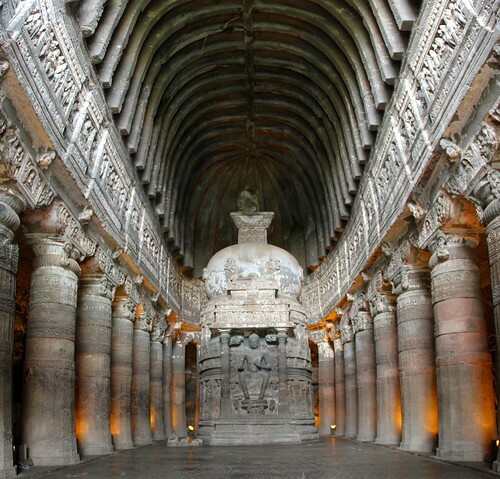 The caves are a series of 30 rock-cut caves that depict Buddhist religious art. They range from small and very simple to multi-storied ornate spaces. They’ve been fairly well-preserved, with some of the interior cave paintings still in decent condition. I stopped by from ‘Looky Here’… I love everything about your blog–as I am mostly an ‘armchair’ traveler, I always enjoy seeing where others travels take them! Love the layout of your blog–crisp and clean, and the photos are awesome, and then there’s your writing! Yep, there is a book there!